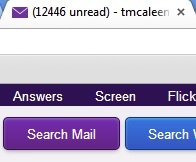 I’m currently in the process of decluttering everything (as you can see from this screenshot, I currently have 12,446 unread e-mail messages). A lot of it is spam, and some of it is reader questions that got lost in the shuffle through the holidays that I did not manage to catch. Anyway, I’ve been trying to opt out of everything and clean up the amount of physical mail and e-mail that I receive, and I thought it would be worth pointing out the two most mainstream ways to get off lists. If you are interested in getting on the “National Do Not Call Registry”, then you should visit this link and have your … Read the rest of this article!